Over the past few weeks I have been tirelessly harassing bloggers and websites alike in order to start generating some reviews for Zombie Youth: Playground Politics and have been fortunate enough to find some really great people out there. More reviews should be coming in between now and August, but you can check out the one done by RJ from RJ Does Books using this link: RJ Does Books! – Zombie Youth by H.E. Goodhue Thanks RJ, it’s much appreciated! 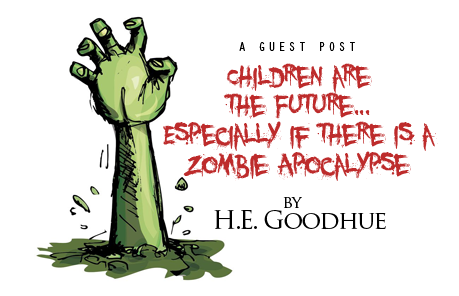 RJ was also kind enough or maybe crazy enough, to let me do a guest post on his site about children and zombies. You can see my rant about the undead, fiber and the future here: Guest Post – H.E. Goodhue, author of “Zombie Youth” Thanks again RJ!